Coming into the first televised Presidential debate, John F. Kennedy had spent time relaxing in Florida while Richard Nixon maintained a hectic campaign schedule. As a result, Kennedy appeared tan and relaxed during the debate while Nixon seemed a bit worn down. Radio listeners proclaimed Nixon the better debater, while those who watched on television made Kennedy their choice. It was one of the closest elections in American history. The Republican insider was Richard Nixon of California, relatively young but experienced as the nation's Vice-President for 8 years under Dwight Eisenhower. The Democratic newcomer was John F. Kennedy, senator from Massachusetts, who at the age of 43 could become the youngest person ever to be elected President. Regardless of the outcome, the United States would for the first time have a leader born in the 20th century. Age was not the only factor in the election. Kennedy was also Roman Catholic, and no Catholic had ever been elected President before. Al Smith, a Catholic, suffered a crushing defeat to Herbert Hoover in 1928. This raised serious questions about the electability of a Catholic candidate, particularly in the Bible Belt South. Questions were raised about Kennedy's ability to place national interests above the wishes of his Pope. To mollify these concerns, Kennedy addressed a group of Protestant ministers. He pledged a solid commitment to separation of church and state. Despite his assurances, his faith cost him an estimated 1.5 million votes in November 1960. Nixon decided to leave religious issues out of the campaign and hammer the perception that Kennedy was too inexperienced to sit in the Oval Office. Nixon stressed his steadfast commitment to fighting communism. He had made a name for himself as a staunch red-baiter in the post-war era, leading the charge against alleged spy Alger Hiss. Nixon emphasized the importance of his 8 years as Vice-President. The Soviet Union and China were always pressing, and America could ill afford a President who had to learn on the job. Kennedy stressed his character, assisted by those in the press who reported stories about his World War II heroism. While he was serving in the South Pacific aboard the PT109, a Japanese destroyer rammed his ship and snapped it in two. Kennedy rescued several of his crewmates from certain death. Then he swam from island to island until he found a group of friendly natives who delivered a distress message Kennedy had carved into a coconut to an American naval base. Courage and character became the major themes of Kennedy's campaign. Although both candidates were seen as moderates on nearly every policy issue of the time, each hailed from different backgrounds. Kennedy was from a wealthy background and graduated from Harvard University. Nixon painted himself the average American, growing up poor in California, and working his way through Whittier College. The combination of New Englander John F. Kennedy and Texan Lyndon B. Johnson created what some called a "Boston-Austin connection" that helped balance the 1960 Democratic ticket geographically. In an attempt to broaden his base, Kennedy named one of his opponents for the Democratic nomination his Vice-President. Lyndon Johnson was older and much more experienced in the Senate. 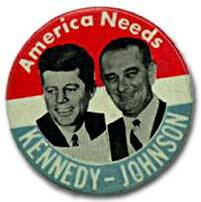 Johnson was from Texas, an obvious attempt by Kennedy to shore up his potential weaknesses in the South. Nixon named Massachusetts Senator Henry Cabot Lodge as his running mate to attack Kennedy in his region of greatest strength. In such a close contest, every event matters. Many analysts suggest that the decisive battle in the campaign was waged during the televised Presidential debates. Kennedy arrived for the debates well-tanned and well-rested from Florida, while Nixon was recovering from a knee injury he suffered in a tiresome whistle-stop campaign. The Democrat was extremely telegenic and comfortable before the camera. The Republican was nervous, sweated profusely under the hot lights, and could not seem to find a makeup artist that could hide his five o'clock shadow. Radio listeners of the first debate narrowly awarded Nixon a victory, while the larger television audience believed Kennedy won by a wide margin. When the votes were tallied in November, Kennedy earned 49.7% of the popular vote to Nixon's 49.5%. Kennedy polled only about 100,000 more votes than Nixon out of over 68 million votes cast. The electoral college awarded the election to Kennedy by a 303-219 margin, despite Nixon winning more states than Kennedy. Get past the clutter of the intro and click on the first Nixon-Kennedy debate, which focused on domestic affairs. Interestingly, the radio audience favored Nixon's performance while the television audience favored Kennedy's. You be the judge. An amazing graphical representation of U.S. Presidential Election results including electoral and popular vote results, and voter turnout by state and county. Click on 1960 for a wealth of information and graphs that tell the story of one of the closest elections in American history. Click on your own state and county to see how your county voted. Join the final debate between Senator John F. Kennedy and Vice President Richard M. Nixon. The John F. Kennedy Library provides the text and audio of this critical debate that focused on cold war issues that involved "...the most ruthless, fanatical leaders that the world has ever seen", according to Nixon. Unlike most modern television debates, these contenders had more time to define their position. Presidential candidate John F. Kennedy campaigned as a staunch cold warrior, complaining about the missile gap with the Soviets, and the emergence of a communist Cuba. In the election of 1960, one state did not award any electoral votes to either Kennedy or Nixon. 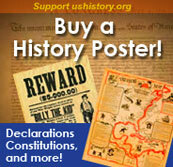 Find out what the renegade state was and who got their votes. John F. Kennedy was plagued by Addison's disease, which nearly killed him on several occasions. Click here to learn more about Kennedy's early years.